Last week, we at the Acara Summer Institute took a break from our classroom work and spent four days observing successful social ventures. We traveled to remote areas, interacting with local villagers and staff and getting a feel for the problems they face, as well as the innovative ways in which those problems are being addressed. I think it’s fair to say that we all stepped out of our comfort zones at least once (and some for longer than others), but that, too, was an important part of the learning process. Part of the group traveled to the village of Kanakagiri in the Koppal district of Karnataka. Samuha, our host organization, works to improve quality of life for vulnerable populations, including women, children, persons with disabilities, and villagers living in drought-prone areas. We heard about several of their many initiatives, from distributing energy-efficient cookstoves to providing products and services to people with disabilities to training young people to work in rural Business Process Outsourcing (BPO) centers. The rest traveled to the Covenant Centre for Development in Madurai, Tamil Nadu. They learned of CCD’s efforts to use local skills and resources to promote community development, visiting sites such as a mango pulping factory and a village founded around the teachings of Gandhi. In our next few posts we will be sharing some observations from the students themselves. Our first authors, Jeff Schmidt and Julie Warner, both traveled to Samuha. The devil is in the details. Our four days with Samuha out among the villages of northern Karnataka crystalized that notion for me, both as it applies toward trying to launch a successful social venture as well as the more mundane aspects of life. First the mundane. It’s important to remember the little things when heading out to rural areas. Like a flashlight. You might think this is a minor detail. Well, I forgot a light, you might say, I just won’t go for walks by myself after dark. And then you find yourself waking in the dark early hours with a bit of Delhi Belly and the prospect of using an already unfamiliar squat toilet, and your hand, in the pitch black. The devil. But the Divine is also in the details. The Divine is realizing the whole experience is improved by candlelight, anyway. And that having a bit of the old DB is an excellent way to quickly become a pro at the squat toilet and hand wipe. Turning to more venture specific learnings, it became more apparent with each village visit or program presentation and the stories that went along with them, that planning is one thing and implementation quite another. Your customers, the wider community, government people, the weather, the roads, wild rabid cats: none of these will care whether your business model indicates you will be profitable by Q2 of the second year. In fact, they will likely all conspire against it. And you won’t learn anything about the details that are waiting to sabotage the best laid plans by laying more plans. You can only learn it by getting involved deeply with the community you are hoping to serve, paying close attention to the tiny, very consequential details, and adjusting and revising you plans constantly with you customer always in mind. 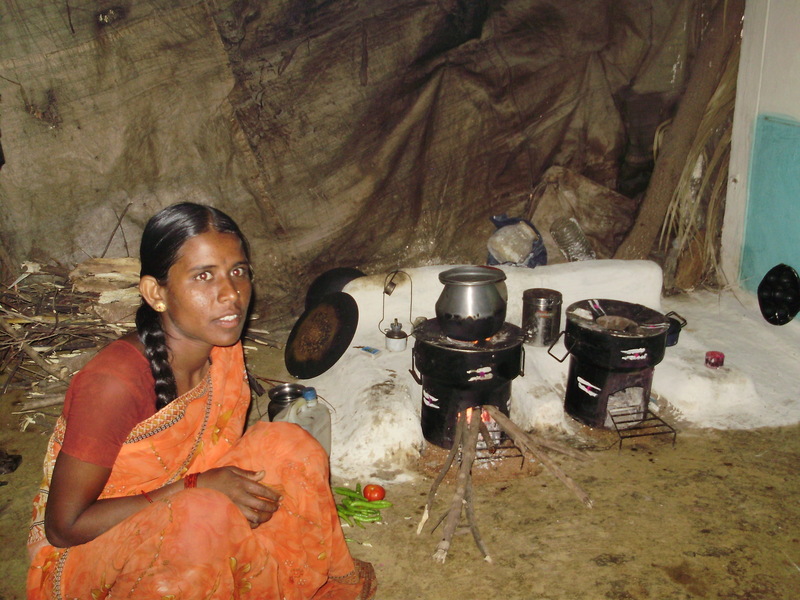 The above photo portrays a villager preparing food in her home using two Chulika stoves. In an Indian household, the kitchen, or area where food is prepared, is considered a sacred space. Our Samuha hosts spoke of Lakshmi, Goddess of Prosperity. When Lakshmi is present in the kitchen, there will be an abundance of nourishment. The stove, on which food is cooked, is integral to this spirituality. The villagers participating in the Chulika Clean Development Mechanism (CDM) project, in order to receive the more efficient wood-burning Chulikas, were required to destroy their old stoves to ensure the integrity of carbon reduction from the new stoves. Thus villagers took a leap of faith in their willingness prepare food on this new stove. Issues of culture and spirituality can unexpectedly impact something as seemingly mundane as changing a stove. “What do you want to do when you grow up?” We were probably all asked this as children. For me, the answer was never the typical astronaut, firefighter, or movie star. No, I wanted to work at Colonial Williamsburg, because I would get to “dress up in old-fashioned clothes.” For those of you who are not familiar with it, Colonial Williamsburg is a “living” historical site in which employees portray the daily life of an American colonial-era (eighteenth-century) town in Virginia. Clad in the attire of the age, men ply traditional trades such as blacksmithing, and women run the household, sewing by hand and cooking over an open fire. What does this have to do with Acara, or with this photograph? Through teaching others about ethnographic research and immersion, and coming here to India, I have realized that my dream was not about permanently renouncing electricity, fast food, and tennis shoes, though I did want to experience life without all of those things. I wanted to feel—as much as is possible—what it would be like to live in a different era, a different culture, a different world, and I still do. For me, nothing transforms your identity faster than a change of clothing. Much like an actor’s costume change, it is a superficial metamorphosis that reflects and encourages an internal one, and influences the way others see and interact with you. And that is one of the reasons why, on my first night in India, I asked my Acara colleagues to take me to a shop where I could purchase some Indian-style clothes. (Incidentally, another reason is that I found out that much of the clothing I had brought wasn’t entirely appropriate for what we would be doing and the people with whom we would be interacting). The result is what you see here. You can probably tell that—even with the later addition of a bindi on my forehead—I still look like a foreigner. Although I did find fewer people staring at me than when I was wearing, say, a pair of shorts, the idea was not to become less conspicuous merely for the sake of not drawing attention, but rather to try to get a step closer to the Indian people. Opening the dressing room door in my new outfit, I could see that my companions Sri and Manaswini were pleased with the transformation. Along the same lines, but on a more serious note, I think that a willingness to step out of the trappings of your own culture helps to build a rapport with your hosts. It shows a respect for the host’s culture—not exposing too much skin, for instance, was especially important in the rural areas we would visit later. Finally, from a subjective side, I got a literal feel for the trials and benefits of those particular garments: the thin cotton kept me cool in the hot sun, but the wide-legged trousers tended to get caught up under my feet. In order for social entrepreneurs to solve social problems, we must understand the problem from the point of view of the customer. And in order to understand someone else’s point of view, you must first, as they say, walk a mile in his shoes. I would add that it helps to put on the rest of his clothing, as well.